Supernatural 9x17 "Mother's Little Helpers"
Gonna try to be quick with tonight's recap. I'm currently in Vegas for a work convention and just fell asleep watching the episode. Whoops! But I forced myself awake so I could get this review done on time. See how much I love ya! 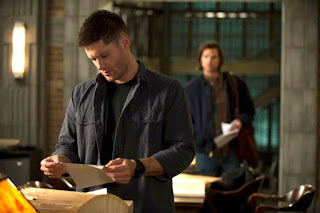 Anyway, Dean is hard at work trying to find Abaddon, so he can get the blade from Crowley and kill the both of them. But, he's not having much luck. Sam, meanwhile, finds a case and wants Dean to come along, but Dean's all like oh no I'm too busy with this, sorry dude. Really, he's just feeling all weird about what the blade made him feel when he touched it, which Crowley points out to him later when they have a little chat in a bar. Which is really all just Crowley apparently testing Dean to see if he's "ready." Ready to just kill Abaddon, or ready for something else? Unrequited love can lead to demon possession, you know. And she sends us into flashback territory, back to the Men of Letters days when Henry Winchester and young Josie, future Abaddon, are investigating a strange and similar occurrence at a local convent. Turns out, Abaddon and some lackey demons were there taking souls from people, though they never really did figure that out back then. They did, however, afford Abaddon the chance to possess Josie, but only after she requested Abaddon possess her rather than Henry, who was her original target. Bum bum bum. Back in present day, Sam heads over to the old convent, which was shut down years ago so appropriately creepy at night. One of the same nuns who was left possessed the last time has still been at it, harvesting souls. For what, you may wonder? Some kind of demon army. And that's not the only place this has been happening, apparently Abaddon has farms all over the country. So, after getting into a skirmish with the demon and, duh, ultimately becoming victorious, Sam frees the souls there and then heads back to let Dean in on the news with renewed vigor in their search for Abaddon. And, of course, Dean does not tell Sam how he's really feeling about the whole blade situation, which always turns out well for them. - When Crowley went to the bathroom, I was thinking to myself - demons need to pee? Then when Dean brought that up a few moments later, I was like ah ha! No! What? That's a random thought. - I'm not sure how the soul harvesting leads to demons, exactly. Does it mean the people are easier to turn into demons, or the souls are turned bad and then put back into the people? Not quite sure what that means. - What exactly does Crowley have up his sleeve with regards to Dean and the blade and all that shizz? Seems he has an ulterior motive, though I'm not sure what. - This episode was directed by Misha Collins, our erstwhile Castiel, in case you didn't know. Bets on whether Jared ever does one? I don't think he will based on past statements, but who knows. Dean: What you call obsessed, I call doing my job. Crowley: You're lying to Sam like he's your wife. Which... kind of makes me your mistress. I don't know what I would do without your reviews. I'd like to thank you for posting even while at work. I read your reviews every Wednesday when I sit down to watch the latest episode. So thank you again! Aw, thanks! I appreciate you saying that! Sometimes it feels a little bit like writing things into a great void, so always nice to hear people like the reviews!